Illustrations can bring your paper to life, often showing concepts you want to express more vividly than using words alone. But we’re not all gifted artists, and sometimes we need a helping hand. 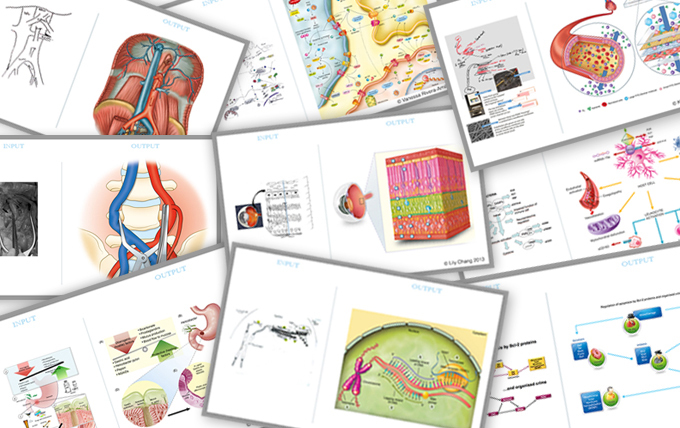 Researchers often look to illustration services, such as those provided by Elsevier’s WebShop, to help them; the improvements can be dramatic. Here we talk to M.V. Bhaskar, Chief Illustrations Advisor for Elsevier, about the process illustrators go through with authors to produce their perfect illustrations, and we see some of the results. There are many authors who have good language skills but lack the graphical skills to illustrate their papers in the way they want to. Illustration is the biggest area where skills are lacking, so in cases where authors feel they cannot do their illustrations justice, we can step in and help. Scientific publishing is a competitive market and images are descriptive, helping authors make a bigger impact with their articles. We provide a free quote within 24 hours, and the top illustrators working with Elsevier then develop a great illustration. What difference can a good illustration make? It is becoming very important to ensure the clarity of the science in illustrated output. Illustration can no longer be regarded as just a component of a paper – we create illustrations for conference presentations, lectures, books, websites, social media and many other channels. Illustrations have also become part of graphical abstracts, in which you try to explain the whole article graphically. Authors have very different needs, how do you work with these? Authors also have different budgetary requirements – we don’t just create full-color complex illustrations, we can also work with authors to make simple line drawings and diagrams, or whatever it is they need that fits within their budget. And it’s not just illustrations authors are looking for – they are part of the visual enhancement services authors need, which include animation, video editing, titling, closed captioning and many other things. Who has copyright of the illustrations? Copyright stays with the author – this is somewhat unusual in the industry, as many other companies retain copyright of the images they develop. Since authors have the copyright, they can use the illustrations however and wherever they want to. What process do you go through when you receive a sketch from a researcher? We begin with a basic sketch from the author – a visual brief, such as a sketch or a hyperlink to something they have in mind – along with written instructions. We then go back and forth with the author if we have questions until our understanding is correct, and then we get started. Some team members are proficient in science, so they are able to find keywords and associations; a lot of work goes into the research before we put pen to paper. The next step is to translate the scientific and technical content to something more artistic – the art of science. This is where the researcher’s vision really comes to life. Once we have a draft illustration, the author provides feedback by annotating it using the WebShop’s online tool. We implement any changes necessary, and it’s ready to go! What are your top tips for good illustrations? There’s no prescription for how to make a great illustration. We work the way you might see garments being pieced together in a factory: each person contributes a different element to the final illustration. There are eight illustrators, eight graphic artists, two researchers and two managers. By and large, the team has a fine arts background. One thing I always recommend is if you do not have the skills, seek professional help as early as you can.